The Slovak economy is a developed, high-income economy. Slovakia became a member of the European Union in 2004. Slovakia is an attractive country for foreign investors mainly because of its low wages, low tax rates and well educated labor force. In recent years, Slovakia has been pursuing a policy of encouraging foreign investment. Slovakia became industrialized mostly in the second half of the 20th century. Heavy industry (including coal mining and the production of machinery and steel) was built for strategic reasons because Slovakia was less exposed to the military threat than the western parts of Czechoslovakia. Exports has been the main factor behind Slovakia's robust growth. In the last ten years exports of Slovakia more than doubled. The biggest share of Slovakia's exports are vehicles, machinery and electrical equipment, base metals, chemicals and minerals. The main exports of Slovakia are also cars, video displays, vehicle parts, refined petroleum and vehicle bodies. Main export partners of Slovakia are Euro Area members with Germany, Czech Republic, France and Poland being the most important. Slovakia has made significant economic reforms since its separation from the Czech Republic in 1993. With a population of 5.4 million, the Slovak Republic has a small, open economy, with exports, at about 92% of GDP, serving as the main driver of GDP growth. Slovakia joined the European Union (EU) in 2004 and the Eurozone in 2009. The country's banking sector is sound. 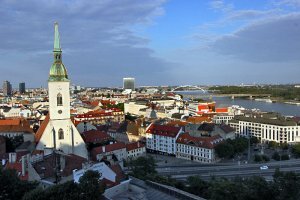 Slovakia has led the region garnering FDI, because of its relatively low-cost, highly-skilled labor force, reasonable tax rates, and favorable geographic location in the heart of Central Europe. However, recent increases in corporate taxes, as well as changes to the Labor Code, slow dispute resolution, and ongoing corruption potentially threaten the attractiveness of the Slovak market. Moreover, the energy sector is characterized by high costs, unpredictable regulatory oversight, and growing government interference. The biggest share of Slovakian imports are machinery and transport equipment, intermediate manufactured goods, fuels and chemicals. 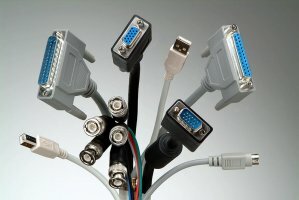 Slovakia's main imports are also vehicle parts, crude petroleum, broadcasting equipment and broadcasting accessories. Main import partners of Slovakia are Germany, Czech Republic, Russia, South Korea and Hungary. 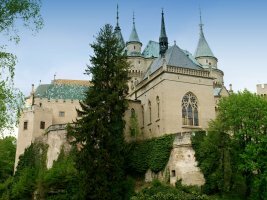 Slovakia is a landlocked country situated in Central Europe, bordered by the Czech Republic, Austria, Poland, Ukraine and Hungary. The country is a member of the European Union, NATO, the United Nations, the OECD and the WTO. A customs union between the Slovak and Czech Republics has been established which allows the duty free exchange of goods between the two countries free from other barriers to trade. A common external tariff (based on the previous Czechoslovakian tariff) is in place for imports from third countries entering both republics. The external rate is a two column tariff based on the Harmonized System. Most duties are ad valorem (per cent), based on the GATT Valuation Code (approximately CIF value - Incoterms 2000). All monopoly on foreign trade and all price controls have been abolished. Any firm or individual that is registered may now import goods from any country. Administration of import registration and licensing is controlled by the License Office of the Ministry of Economy of the Slovak Republic. It is strictly forbidden to import poisons and sensitive chemicals. Import of military material, poisons and narcotises is under special procedure of personal license. Instructions for use, description of a product (especially food) and warranty manual has to be written in Slovak. Price bar code has to be printed on the package. Any specific requirements will be stipulated in the contract. Health certificates, issued by the appropriate authority in the country of origin, are required for shipments of animals and their products and plant and vegetable products. A special certificate issued by the Slovak State Testing Office is asked by customs officers at the border. Obtaining the certificate from a country of origin is the full responsibility of the importer. The Slovak Republic follows EU rules. Goods should be securely packed, having due regard to the nature of the goods, means of transport and likely climatic conditions during transit and delivery. The outer containers should bear consignee's mark and port mark and should also be numbered (to accord with a packing list) unless their contents can be otherwise readily identified. The sales contract number and country of origin must be shown on containers. There is no prescribed form. A minimum of three copies is required and must contain all details relevant to the shipment, including the sales contract number. The original is required for clearing goods through customs and issued in the number of copies requested by importer. 'To Order' bills acceptable. May be requested within the terms of the contract - otherwise, only required for wine and wine distillates cleared under the MFN tariff. Imported food including package has to be certified by the Slovak Testing Office prior distribution. After European Union (EU) accession import policy follows EU rules. The Licence Authority of the Slovak Ministry of Economy must license imports of animals, animal products, plants and vegetable products. The individual items are subject to the Public Notice #15/98 and Act 576/2001 of Ministry of Economy of the Slovak Republic stipulating conditions to grant an official permit for import and exports of goods and services, and Act #147/96 of Collection. These products from import administration point of view can be split into two groups. The first group covers live animals, foodstuffs and foodstuffs of animal origin and fodders, requires veterinary certificates by the State Veterinary Administration of the Slovak Republic. The second group, includes plants and seeds, requires phytopathological sanitary certificate and in some cases even additional declaration by FITO Service. Specific requirements are normally stated in the sales contract and consignments undergo either a phytopathological or veterinary examination at the frontier station of entry. Pharmaceuticals require an import licence issued by the Ministry of Health. At the same time any pharmaceutical is subject to the registration by the State Institute of Pharmaceutical Control prior to import. Electrical appliances, toys, fireworks and cosmetics must conform to safety regulations being identical with those of EU.